While actual spring is slowly starting to arrive, dreams of sunshine and double-digit temperatures keep us going through the hold out of winter. An uplifting thought for many is that, next year when the weather gets bad again and it seems like summer will never come, there’s always Spring Break and a week of pure bliss. Spring break may be a whole year away, but it’s never too early to start planning a getaway — especially one that gets you far, far away from snow. Mexico is home to lots of popular Spring Break locations: Puerto Vallarta, Playa del Carmen, Cancún and Cabo San Lucas. While these places offer plenty of beaches, plenty of sun and plenty of alcoholic beverages, they really don’t give travelers much more to see of the larger country. This past Spring Break, I went on a road trip through Baja California Sur, which included stopping in Cabo San Lucas. However, Los Cabos isn’t the only thing this paradise has to offer. Located about an hour north of Cabo San Lucas, the Pueblo Mágico, Todos Santos offers colorful homes, delicious mangoes and a quiet reprieve from the craziness of the Cabos. A Pueblo Mágico is a city deemed by the Mexican government to be untouchable. That is, it preserves its historical buildings, landmarks, culture, traditions and beauty. Todos Santos has a historic mission that maintains a church and a courtyard. Right in front of the mission is a plaza, where vendors set up their wares and visitors can sit under the shade of a gazebo. For classic rock fans, Todos Santos is also the purported home of the Hotel California of Eagles fame. The truth surrounding this is a little shaky. Mostly, the story depends on a lyric from the song that goes, “I heard the mission bell.” This is the only evidence, but believers suspend doubt in favor of the lovely place. Only 15 minutes away from Todos Santos is Cerritos Beach, which is especially great for any surfers. Cerritos offers waves for experienced surfers and surf lessons for unexperienced surfers. However, if you don’t want to experience the might of the ocean, there’s plenty of space to roll out a towel and take in the sun. Another hour north of Todos Santos, and two hours north of Los Cabos, is the capitol of Baja California Sur: La Paz. La Paz lives up to its name: complete peace. Unlike Los Cabos, or even Todos Santos, there aren’t many tourist attractions to distract from the city itself. 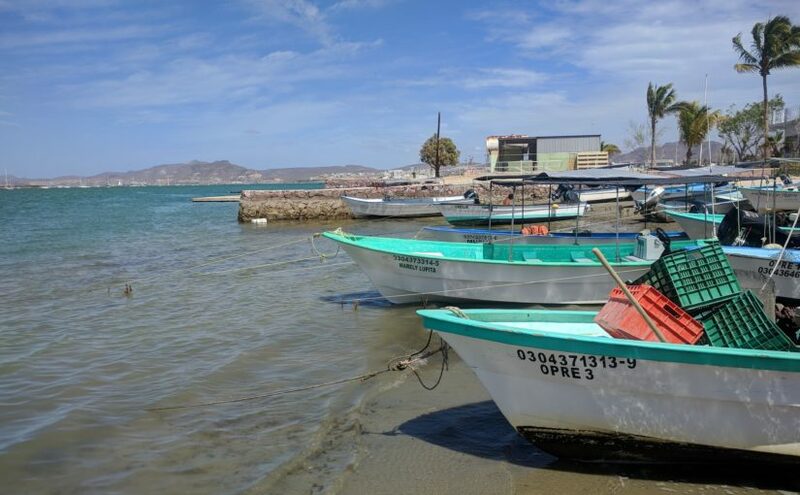 However, La Paz is home to plenty of opportunities for enjoying the ocean. The first of these would be the whale sharks. La Paz is home to a large population of whale sharks, and you can swim with them if you get a good tour. If you aren’t willing to pay the price of admission or go out on the ocean, La Paz also has the Whale Museum where you can see exhibits and dioramas about all sorts of whales. Second is Balandra Beach, often touted as one of the most beautiful beaches in the world (at least to me). Balandra is a peaceful beach located about 15 minutes away from La Paz. There are no resorts, no restaurants and limited sellers to bother the beach or the beachgoers. Balandra’s water is shallow and calm. You can walk out 50 feet without the water ever reaching past your knees. Balandra Beach is also home to a famous rock formation, the Mushroom of Balandra, which you can walk to and take your picture with. A larger rock is balanced on top of a thin column of rock, created after years of weathering. While this is interesting to go to, it’s also contentious as it’s an unprotected area (meaning anyone can get to it). Protectors of the rock argue that continued human contact could degrade the rock, and soon it will disappear from human intervention. This is more of a day trip. Cabo Pulmo National Park is a large nature reserve that protects not only the land environment, but also the aquatic environment. At Cabo Pulmo, visitors can get scuba or snorkeling trips and see the reefs, schools of fish, sea lions and sometimes nurse sharks. Because it is a national park, visitors aren’t able to touch or take anything from the water. You also can’t touch the sea lions, as according to my snorkeling instructor they “like to bite your fins and play with you.” Even still, seeing the color of the ocean and the peace with which these animals live is a worthwhile experience. Technically, this is still a Cabo, but, unlike Cabo San Lucas, San José del Cabo doesn’t have as many clubs or as many beaches, making it a calmer Spring Break location. San José del Cabo has a thriving downtown area, which is best known for its incredible gallery district. Fifteen galleries show a variety of art forms, from painting to sculpture and jewelry making to folk art. Every Thursday night, from October to June, these galleries open their doors for passersby during the Art Walk. During this time, galleries are open, free refreshments are served and art shines. A short distance away from the center of San José del Cabo is Flora Farms, an organic community comprised of shops, organic farms, restaurants, wine and cheese bars and cottages and homes. Flora Farms offers tours of their land and of their homes. Their restaurant is also worth a visit. While it’s pricey for the college student’s budget, their dishes are delicious and well worth the extra dough.